To answer the OP. I recommend the unedited... Japanese version and here's why: * Fully unedited, and includes the occasional sexual innuendo and four letter words which will then ensure the continuity remains intact * Continuity, and oh, did I say, continuity? * The voice acting work is far better than the dubs as we all know (same holds true for more mainstream anime) The videos on Youtube are often ones recorded from live TV (especially if the time is shown on the screen). I have the DVD set, and what I have done is to rip all of that to mkv and add subtitles so I can watch it on mobile or on the TV without having to load discs into a machine. In all its 78 episodes, some of which were never shown in Japan due to failing ratings. Probably has never played a game, nor knows much at all, about the franchise, like most people I meet these days. Personal research time, your input appreciated greatly I am asking the question here because I want to personally reflect and find out where we all stand with the Sonic fandom. First and foremost it is quite obvious we are all here because we really like the blue hedgehog but I want to delve a little bit deeper and find out what the various reasons are. 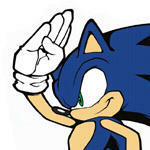 For me personally, after 20 years of ups-and-downs with SEGA and their mascot its been a bit of a ride, but there is something there, that makes me just realise sometimes why I like this gaming character so much. Everyone's reasons are different and I'd like to learn more, if possible. Sonic, is, to me, what some people feel their therapist, guru, or other is. Basically like the character, Wilson, from the film, Cast Away, there was a period of great difficulty in my life, and being surrounded by a nice Sonic game at the time, really just touched me, I guess. I was very alone, with no support at all, and I went through it, on my own, and with my furry pals from my game. From then on its been a personal thing, combined with my real enjoyment of the character's personalities for the most part. I also fell shoulder-deep into the magic of Sonic Adventure, at the time, we could not afford, or even attempt, to buy a computer that could produce that kind of graphics and gameplay. That, with an interesting story, and an exciting phase in the fandom is likely what sealed my fate. Of course I am aware that folks are into this franchise for different reasons. I have even seen some strong opinions here, and for the most part I also agree with some of those, but, I am trying to go deep, what is it that brings us together here? I thank you for your time very much. I thought about this and I have to agree. Its never been about continuity, its all about changing things up. This explains why they split the franchise into two distinct paths a while back.. Sonic Boom for the kids, and normal, modern Sonic, for the teens and adults. It then makes perfect sense- keep the franchise nice and loose, to ensure you can (or attempt to) catch the next wave of kids who might pick up the Sonic games with new changes. I guess that's why I didn't like Sonic Unleashed, it went into a game territory that, at the time, was appealing. It probably also explains my fixation on the SA1/SA2 era, as that was the kind of game I liked... and I hark back to those days. So to be clear- A proper reboot would be like taking what worked, keeping that as a starting point for improvement? In which case I can see the likes of Sonic Boom, being sent the way of the trash can, along with a number of new characters. A reboot you say? Hell yes! If it were up to me I'd go back to SA1/SA2 era, and start there.. because the crappy games (games I won't even play) came after Sonic Heroes. Even Sonic Heroes has its flaws. I have had, over the years, many ideas of how to do this, but the starting point is there in SA1/SA2. When the game transitioned to 3D it was cool, after that it seemed it went really pear shaped. SA1 and SA2 are what got me playing, that's what got me into a fully blown Sonic fan from just a casual interest in the franchise. Upon recent reading of some books about SEGA, it really was interesting. I learnt, for example, about the battles between SEGA of America, and the HO in Japan. I had also recently learnt, (about 18 months ago) that Peter Moore actually told Yuji Naka to f-off to his face. Other things I can remember off the top of my heard are: * Sonic Adventure 2's storyline is sort of crappy at first glance, but it makes sense if you look at it in perspective, and bear in mind what they were going through at the time (SEGA was in trouble, jobs were on the line, etc) * The SEGA Dreamcast was actually a cutting-edge piece of kit, which basically explains why my desktop PC was a piece of crap, no matter how hard I tried or how much money I spent. Thread bump, sorry about that. This is the start of something really nice.. This was done a week ago. .
My response to the Ugandan Knuckles meme This was a scene I did from Sonic X I basically drew this painstakingly without a tablet, in Corel Draw The following artworks are messages to a furry whose head is stuck up his freaking backside Cream and Cheese. Incorrectly named in filename but its all good..